Thank you for a lot of lovely comments on my Blog Hop Challenge post of Puppy Love / Bee Happy sets. I'm very very happy that many of you like my new stamp sets! 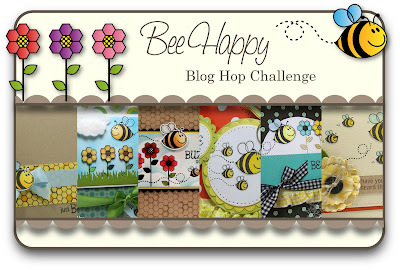 :) If you have not joined in this month's TSG Blog Hop Challenges yet, be sure to go to the TSG blog to get the details. 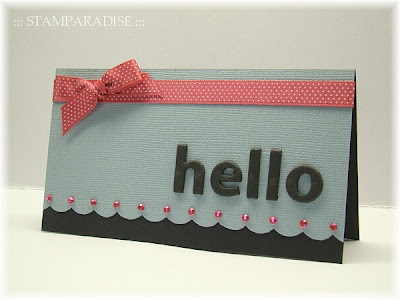 The card I'm sharing with you today is for Cas-tastic Wednesday Challenge 014 - to create a CAS card with some BLING. When I saw this theme, I thought that it would be a good opportunity to use some of my embellishments that had been neglected for a while. The result is not comfortable for me, but my daughter said that it was pretty. ( She loves pink and black combo.) So I decided to show you it today. 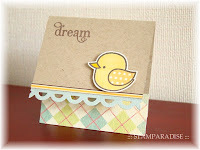 Make sure to stop by the TSG blog today to see new TSG Tips & Tricks sheets feauturing the brand new stamp sets! The Tip Sheets will also be available to download as .pdf files so that you can print them out to keep on hand for easy access during stamping! Thank you for stopping by. Have a wonderful weekend! 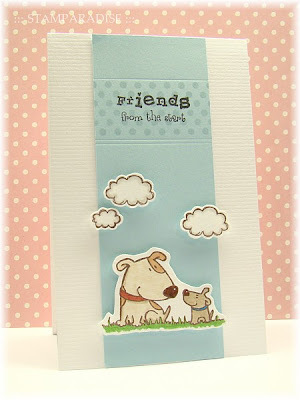 Finished size: 3" × 5 1/2"
Today we have sneak peeks of two stamp sets, "Puppy Love" and "Bee Happy" that I illustrated. Puppy Love is a 4×8 stamp set that includes a total of 39 stamps and will sell for $18. This set includes the sun, a couple of clouds, tiny butterflies as well as cute puppies, so that you can make various scenes with them! 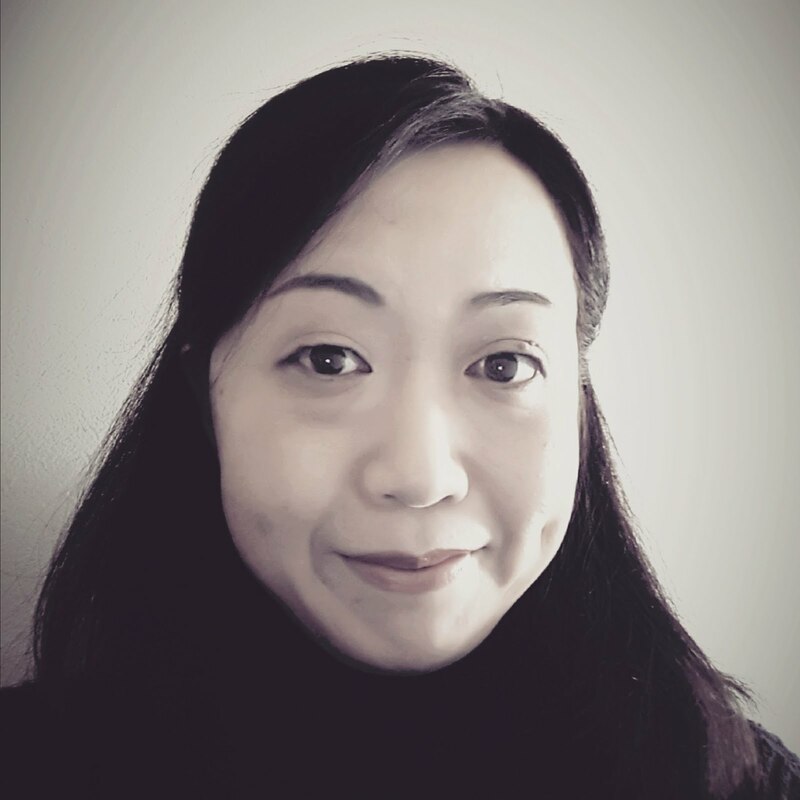 In addition to that, Jessica has added a lot of fabulous sentiments and words that perfectly matched with the images I drew. 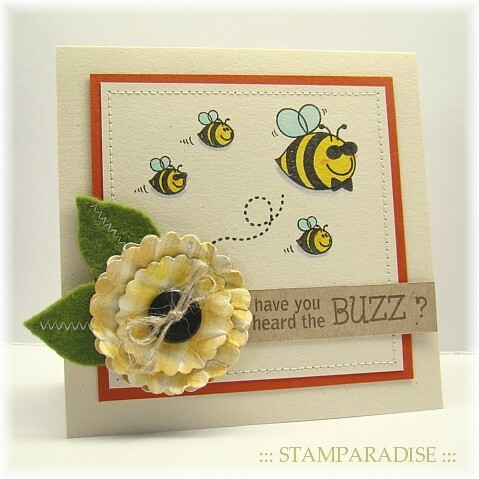 Bee Happy is a 3×4stamp set that includes a total of 27 stamps and will sell for $7. I had some of my bees wear sunglasses and a bow tie included in this set. Aren't they cute? 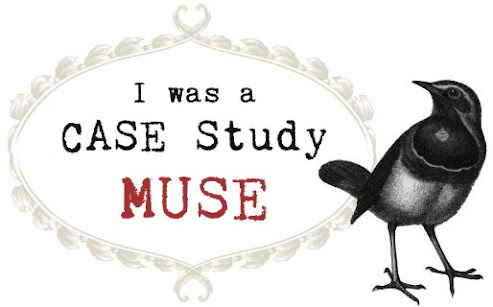 ;) In this case, I recommend using an opaque ink like a Versa Magic. 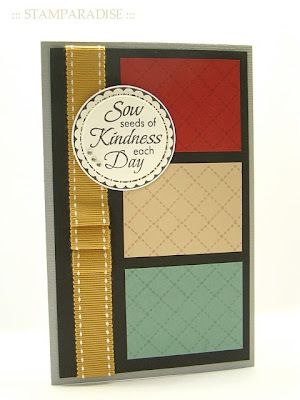 Would you like a chance to win these stamp sets? 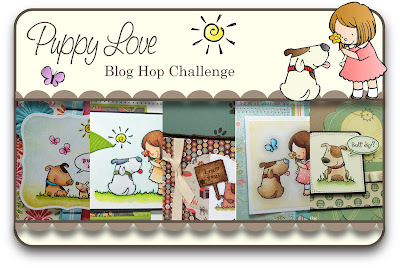 What you need to do is go to each of the Trendsetter's blog and leave a comment on their Puppy Love / Bee Happy Blog Hop Challenge post. Then return to the TSG blog, and add your name to the Mr. Linky. 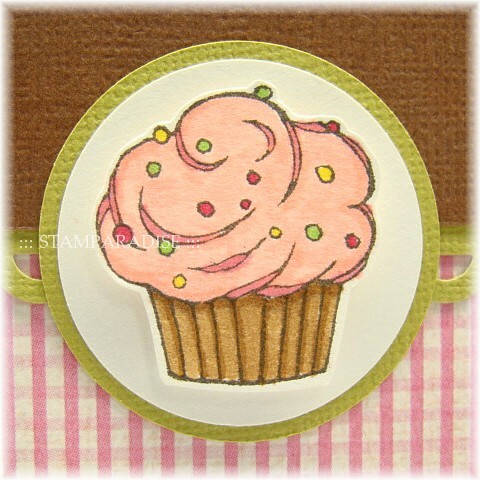 The sneak peek of my new stamp sets (Yes, I said 'sets'! Two stamp sets that I illustrated are going to be released this month!) starts on Thursday 12:00 EST. Don't miss it! Today is really hot day again... So I thought I had to play with "cool" colors and the color palette at the Color Throwdown Challenge 102 was perfect!! 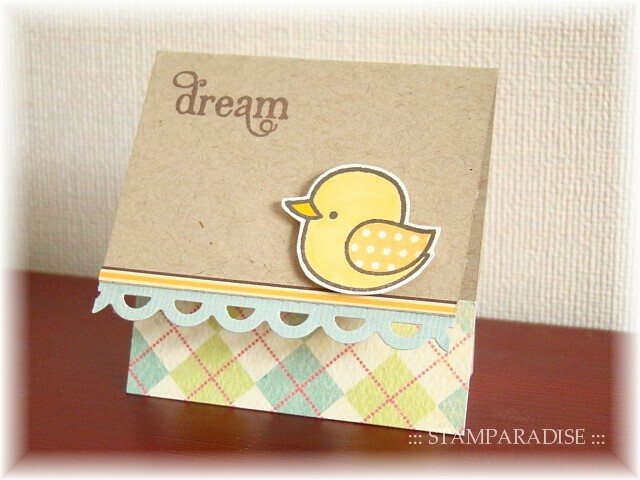 Plus, this weeks Cas-tastic Wednesday Challenge (CWC013) is Summer Inspiration. I decided to combine these two challenges on my card. 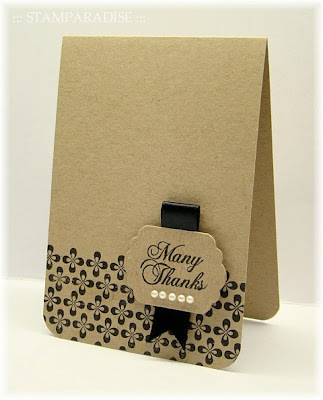 At first, I stamped shell images with Versa Mark ink and heat-embossed them with clear EP. Then I sponged Summer Sky ink (Memento) and Oasis Green ink (Versa Magic). 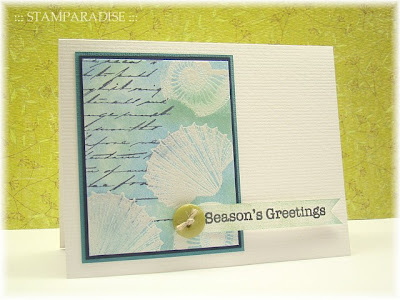 After I stamped a script stamp with Denim ink (Versa Craft), I wiped out excess ink that was left over the shell images. I matted the focal panel and attached it on the white cardbase. To finish my card off, a sentiment flag and a button with linen twine were added. 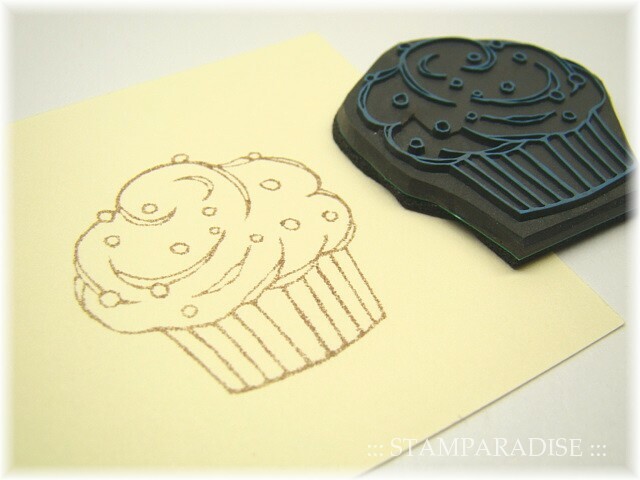 But I managed to carve a new cupcake stamp which is smaller than the previous one. And here is a card I made using it. 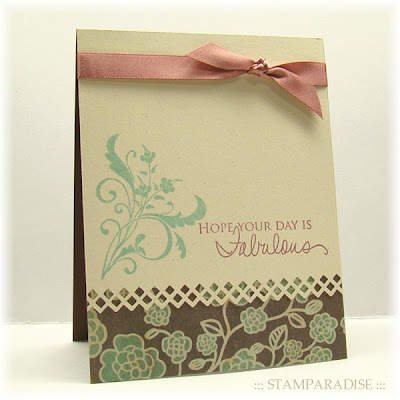 I used an old sketch from Clean & Simple stamping blog, FTL 23. Thank you for stopping by! Have a nice day~! Here are a couple of cards I made with my new stamp. My cupcake was bigger than I had expected. I think that a big size stamp limits the choice of layout. Right? 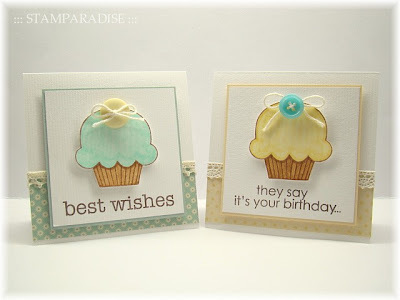 I like how these cards turned out, but I will carve another cupcake stamp which is smaller than this so that I will be able to enjoy various layouts with it. Thank you for stopping by. Have a wonderful Sunday!! Finished Size: 4" × 4"
Thank you for stopping by today. Have a nice day!! Finished size: 5 1/2"×3 1/2"
I made this card for Crazy 4 Challenges #45 which is the color challenge -- Red, Black and White. It's super quick card. Actually, I completed this card within 15 minutes! 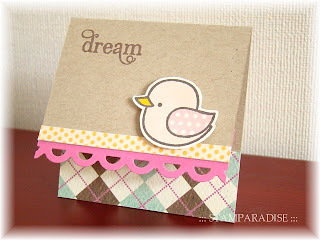 I cut some cardstocks and patterned paper, and put them together. Then I made a felt flower with scalloped circle nestabilities and embellished it with some pearls and some cotton lace. 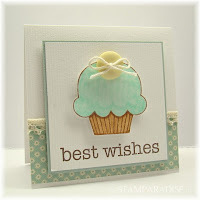 The sentiment was stamped with Cloud White ink (Versa Magic) to finish the card off. Thank you for stopping by today! I hope your week will be happy and safe! This weeks theme at the Cas-tastic Wednesday Challenge　(CWC 011) is to make a CAS card using kraft! What a wonderful challenge! I LOVE kraft paper, and I made two cards for this challenge. I combined kraft with light purple on this card. 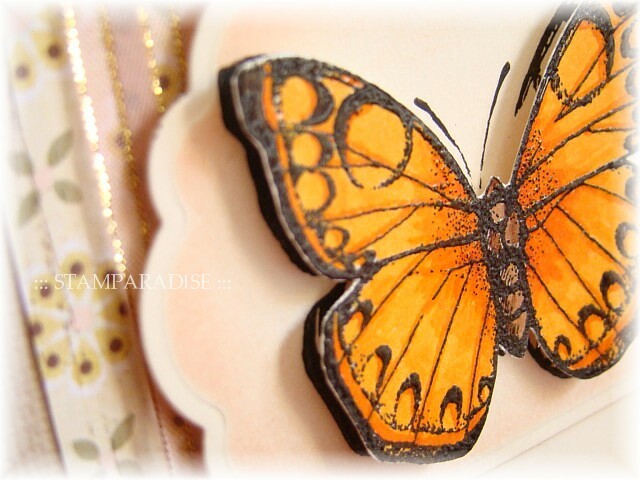 Butterflies were stamped with Sweet Plum ink (Memento). 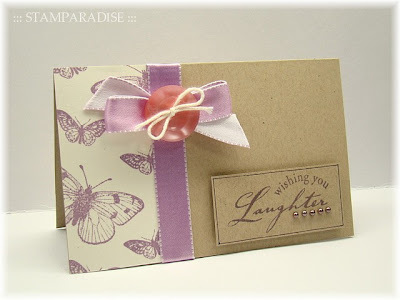 After I added some ribbon and a bow with a big button, I stamped the sentiment onto the card base directly. ... Yes, I said "directly". But it was skewed! 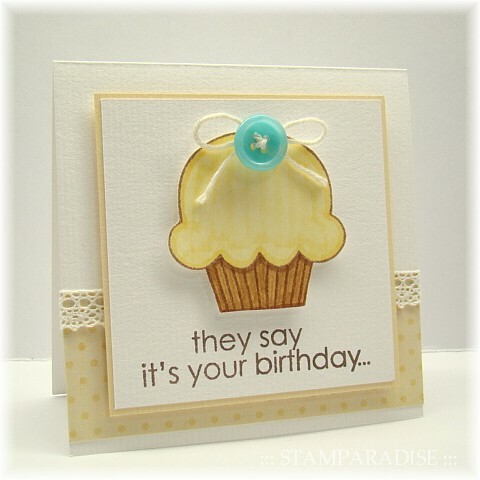 :( :( I gazed at my card for a few minutes, then decided to add an 'extra' panel to cover the skewed sentiment. LOL! I think it was great idea and the result was not so bad. It's really simple. I've completely succeeded in stamping this time! lol! I love the elegant looks of this color combo (kraft and black). 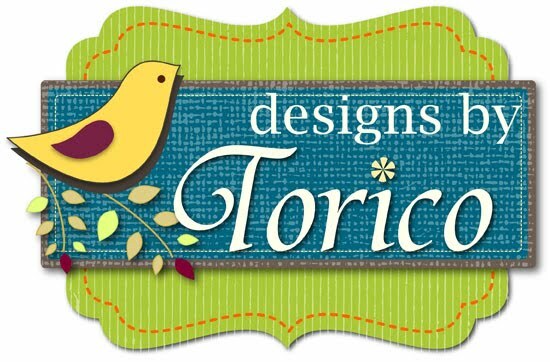 I designed this logo basically, and Jessica completed it adding some texture on it. (Thank you so much Jessica! ) I really adore it!! 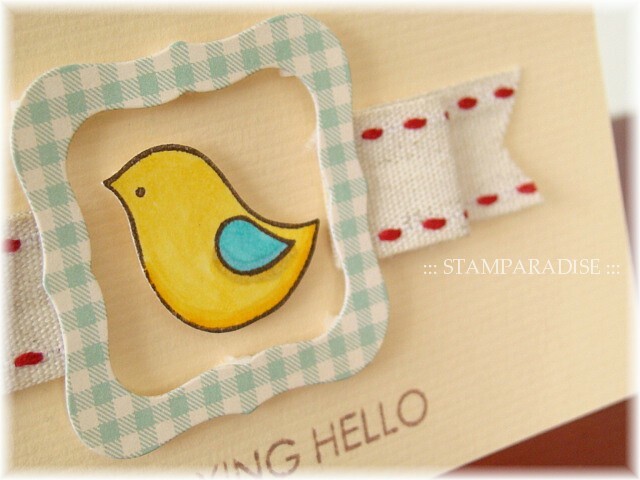 So I had to make this birdie into my own hand-carved stamp! I used the sketch from Card Patterns 71. The birdie was colored with Copic Markers. The frame was made by using Label 1 Nestabilities and adhered with dimensional foam. 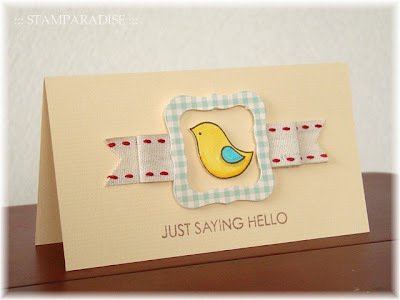 I'm entering this card to this weeks Charisma Cardz Challenge --- their theme is "Watch the Birdie". I found these very cute buttons at a local craft shop a few days ago. As soon as I saw them, I fell in love with them since they look like sweet candies! 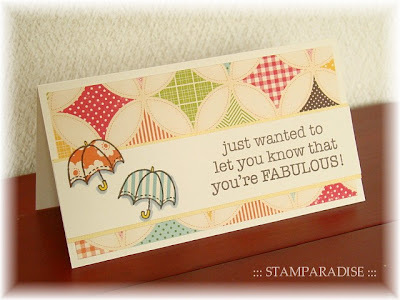 :) I couldn't resist purchasing them and made a card with it last night. 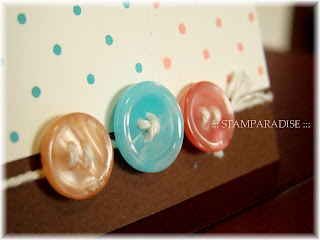 The layout and sentiment were kept simple so that cute buttons stood out. The polka dot background stamp ( from Hero Arts) was stamped with the colors that matched to buttons. 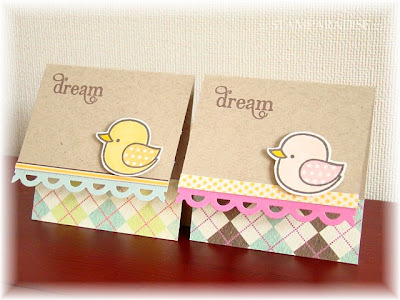 The mini cards I'm shareing with you today are quick and easy to make. But it was difficult to take a good photo... LOL! Did you get a reason for my difficulty? The card base was measured to 2 3/4" square. Then I cut the front panel shorter than the back panel. So they are not able to stand by themselves. :( I regret that I've made this type of card. But it is so pretty that the DP on the back panel is shown when the card is closed, isn't it. As most of you know, I have persisted in using my own hand-carved stamps to make a card. But I'm very tired, and I'm getting to know the pleasure of using clear stamps. 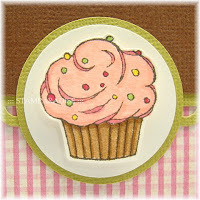 So I leave off persisting hand-carved stamps. I'll use clear stamps more and more in future. This card was based on the sketch from this weeks Cas-tastic Wednesday Challenge (CWC 010). The beautiful butterfly is from Hero Arts. I think it is impossible to delineate such a delicate line or shades like this by hand-carved stamps. 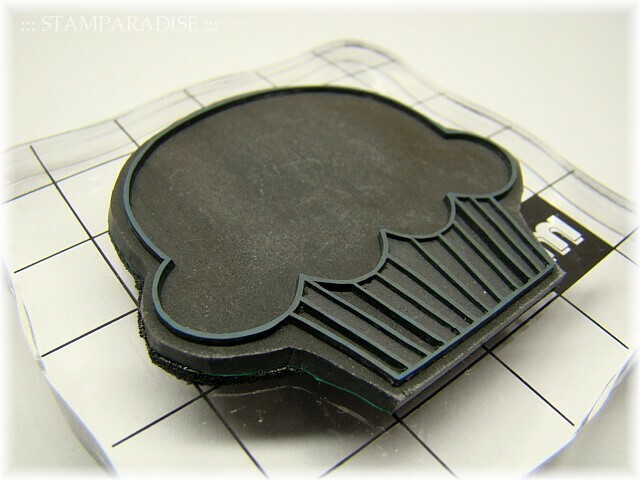 I stamped it with Real Black (Versa Craft) and heat embossed with clear EP. Then I colored it with Copic Markers. 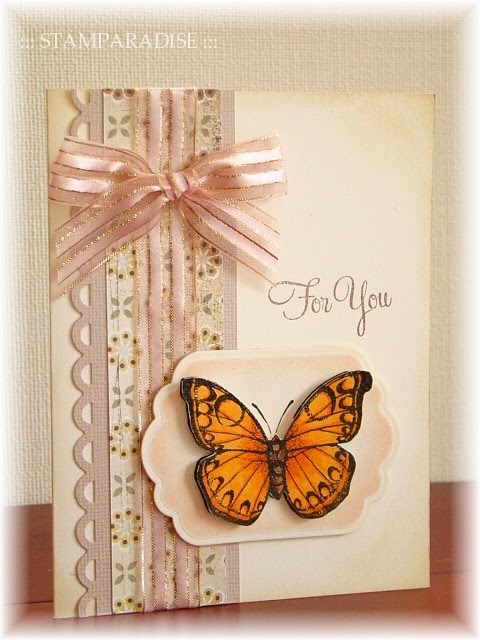 The focal panel was sponged with Tattered Rose (Distress Ink), and the all edges of the card base were distressed with Antique Linen (Distress Ink). 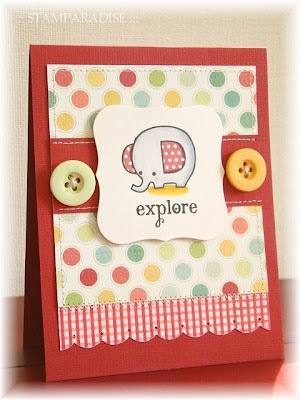 I stamped the little elephant with Real Black (Versa Craft) and colored it with Copic Markers. 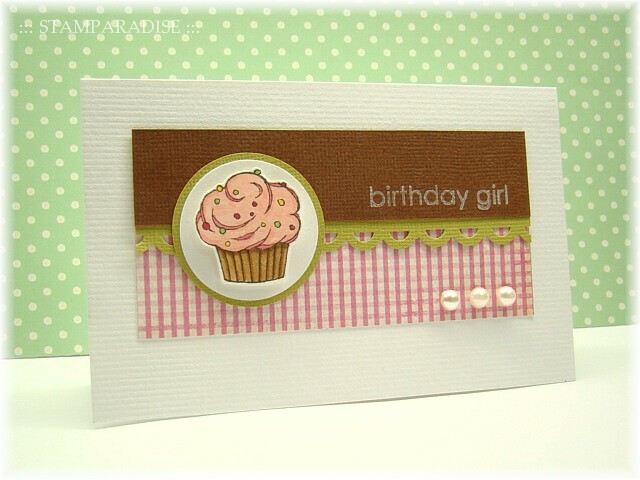 The ear part was stamped with Brick (Versa Craft) to match the color of card base. 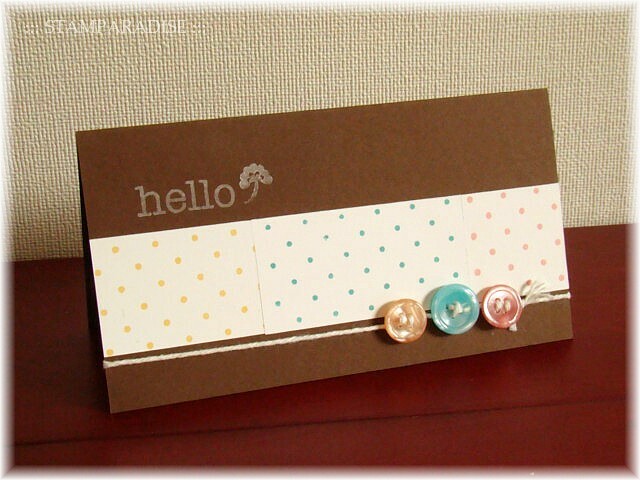 It is very fun to consider a color combination of animal's body and polka dot part on this set!